For six and a half innings, the Yankees seemed hung over after blowing a six run lead in yesterday’s game. The offense struggled mightily against Justin Masterson, who entered the game with an 11 game losing streak and a season ERA of 6.13, while the defense contributed to both Indians run scoring rallies. Luckily for the Yankees, however, the good AJ Burnett showed up and seemed unfazed by the events of the previous day. 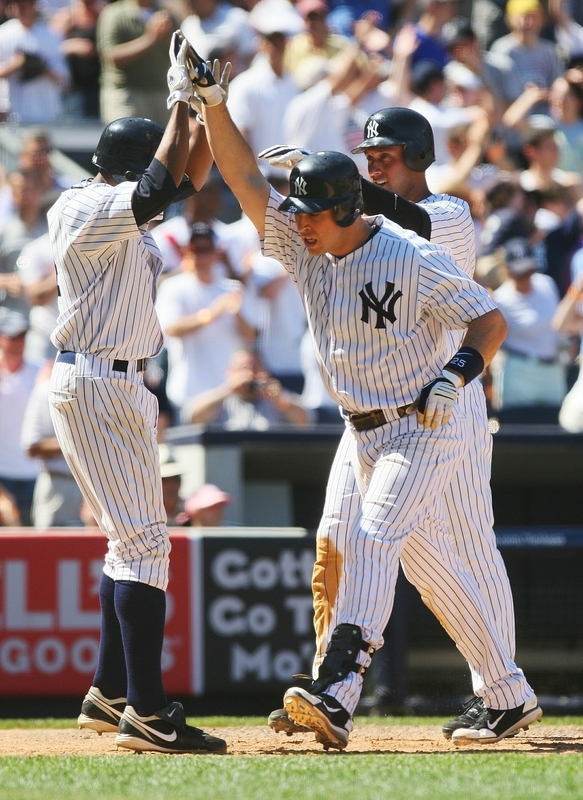 Mark Teixeira's 8th inning HR powered the Yankees to a comeback victory over the Indians (Photo: AP). From the first inning, Burnett used his entire arsenal to set up the Indians hitters. Burnett’s command of his four seamer on both sides of the plate allowed him to get ahead early, which left the Indians’ batters vulnerable to his sharp breaking curve and darting sinker. In spite of pitching so well, Burnett found himself trailing for most of the ballgame. While the Yankees struggled to sustain any pressure against the embattled Masterson, Burnett’s defense allowed the Indians to build a 3-0 lead. In the top of the third, Brett Gardner eased up on a very catchable ball that landed in front of him for an RBI single. Then, in the top of the seventh, Derek Jeter’s throwing error not only provided Cleveland with an insurance run, but extended the inning for Jason Donald, who hit a ball to deep right that Nick Swisher played into a run scoring triple. At that point, the Yankees could have used God Bless America as a lead-in to their Sunday night plans, but Nick Swisher’s lead-off single quickly offered a glimmer of hope. After Miranda grounded out to first and Gardner reached on an infield single, Girardi opted to pinch hit for Chad Moeller, but the strategy backfired when Francisco Cervelli struck out on a 1-2 sinker. Now with two outs, Jeter immediately fell behind 0-2. For the second time in the game, the Yankees were on the verge of stranding a runner at third, but the resurgent Captain got a sinker up in the zone and lined it into center field. The base hit scored Swisher and Gardner, who just slid home before Trevor Crowe’s strong throw, and knocked Masterson from the game. With Granderson due up, Indians’ manager Manny Acta brought in lefty Tony Sipp, but just as it did on Friday, the move failed to bring any relief. After Curtis Granderson doubled Jeter to third on a 2-0 fastball, Mark Teixeira battled back from a 0-2 hole and launched a 2-2 slider deep into the left field seats (which YES analyst Paul O’Neill dubbed State Farmville, after the advertising signage in that section). After pitching so well from behind, Burnett came out for and breezed through the eighth inning, ending the day with his seventh and eight strikeouts. The Yankees then tacked on two more runs in the bottom of the eighth before Mariano Rivera slammed the door in the ninth with two classic Mo strikeouts as well as an athletic 1-3 putout that required the Yankees’ closer to hop over a broken bat, field a slow grounder and then fire to first. After suffering such a brutal loss on Saturday, dropping today’s game would cast a cloud over most Yankee fans’ Memorial Day barbeques. Now, instead of a lost, long weekend, the Yankees look to win three of four from the tribe on Monday. Mark Teixeira’s 8th inning home run was the 250th of his career. He also drove in his first runs via a hit in 11 games. The Yankees win was the 300th of Joe Girardi’s managerial career. Robinson Cano recorded his 23rd multi-hit game, one behind Ichiro Suzuki for most in the major leagues. Lucky 7th: So far in the series, the Indians and Yankees have combined to score 19 runs in the seventh inning. I bet Micheal Kay is going to discuss the lucky 7th inning in tomorrows game!